A dance concert celebrating women mathematicians throughout history and their struggles to create groundbreaking mathematics. A one page response form with questions for students to answer demonstrating that they attended the concert and asking for thoughtful responses; please use for attendance credit or extra credit. A two page discussion question form for written response or class discussion dealing with issues related to historical discrimination in mathematics. 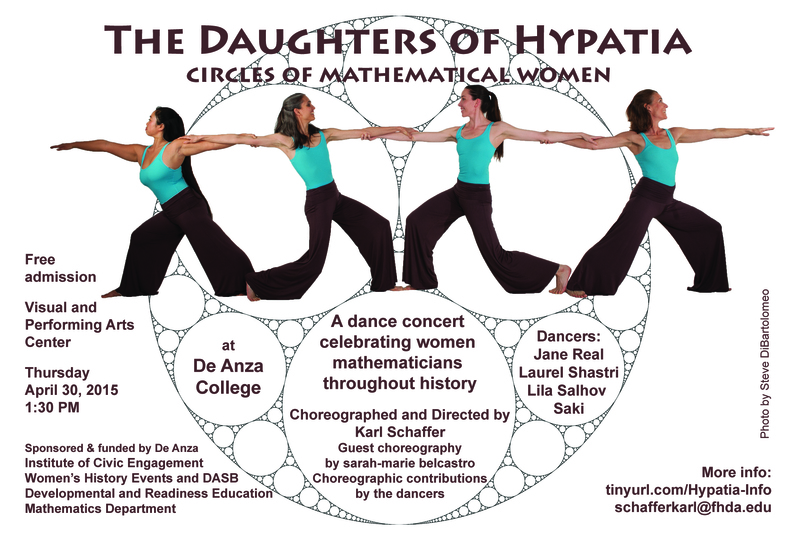 Facebook page for April 30, 2015 De Anza College Performance - invite your friends! April, 2015 pre-publication draft of Hypatia study guide, 6.4 Mb. (This version for use by De Anza College classes). Contact Karl Schaffer directly for a copy.